It was one of those days. The broken air conditioner had blown hot air at us all day. The stuffy classroom put all twenty-five first graders and me in a cranky mood. Everybody was in everyone else’s space. I wish I were making those up, but, fellow teachers, you know I’m not. We made it through the day. By the skin of our sweaty teeth. But we made it. After school an unexpected cart of new computers was delivered, a delightful surprise, except for the fact that the charging cart they’re required to be stored in is roughly the size of China. Since I was going to be out the following day, I knew I had to rearrange my room, lest the natural disaster called Leaving My Class With A Sub should strike and sweep the new computers up in its funnel. So in the sweltering heat of my classroom, I lifted and grunted three dinosaur computers out of my room. The dust bunnies that had gathered behind the computers scampered away. I heaved the now empty table out and rolled the new computer cart into place, plugging it securely into the outlet, which is when the breaker box decided it, too, had simply had enough of this day. Every machine in my room went silent. I stood in the silence and the heat, shaking my head. The clock was minutes away from 6pm. I was hot and tired and hungry. I wondered what else could go wrong. You’d think I’d know by now not to ask that question. After I’d located a custodian, who unlocked the breaker box and flicked the switch, I readied my room for the substitute. As I took a final look around my classroom, I heard what can only be described as a sizzling sound emanating from the outlet near the Books on CD station. Sizzling sounds in the classroom are never, ever good. The sizzling sound came from batteries recharging in the charger. I pulled the sizzling charger out of the outlet, threw the culprit batteries in the battery recycling container, and wiped away the battery acid magma that had oozed onto the table. I slung my purse over my shoulder and glanced at the clock. 5:57pm. I’d been at work 11 hours. Lunch felt like it was decades ago. As I closed the door on the day, I had a fleeting wish that I was back in my Ugandan classroom. I had pangs of longing for the simplicity of teaching in an open air classroom under a thatch roof, where the only tools were a blackboard, me, and my students. I stepped into the shared space outside of my classroom and nodded in solidarity at the handful of daycare kids who, like me, had been at school for 11 hours. Poor kids. Poor daycare teachers. One little boy sat coloring at the round table just outside my door. I hadn’t seen him before. I know I would’ve remembered him because his skin was the rich coffee bean color of my Ugandan sons. I paused to look at his picture. His nametag sat like a tent on the table and the sight of his name stopped me in my tracks. 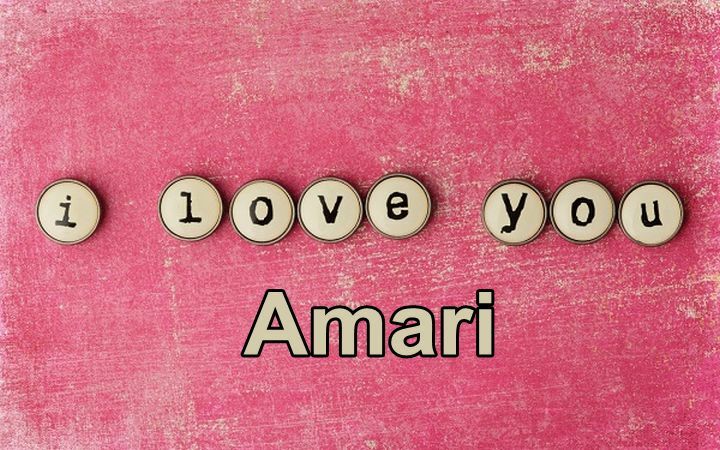 Amari is the Lwo word for, “I love you.” It’s the phrase my Ugandan sons use when signing messages to me. It’s what we say to each other with our hearts in our throats when I leave Uganda and return home every summer. At 5:58pm, here it was, waiting for me at my classroom door. I tend to forget the remarkable measures God takes to make me know that He sees me. On days when I’m cooked and in the dark and hungry and any semblance of energy I once had has long ago left the building, He sees me. I wish I were one of those people who picks up on God’s more subtle messages. I’m not. I probably never will be and that’s okay because the better news is that on days like that when I am, at best, a worn out thread of myself, God takes extraordinary measures to make sure I know that I’m loved. Dear One, maybe you needed that gentle reminder today, too. On days when it’s all you can to do to put one foot in front of the other to wade through the wreckage, God sees and loves you. In case we haven’t made our thoughts on this abundantly clear yet, here at Vigilante Kindness, we believe every person has been given a gift, and we’re big on people using their gifts and talents to serve others. We’re absolutely delighted that several Redding groups are using their talents to throw a benefit concert Vigilante Kindness. On May 30th from 6pm-10pm at Old City Hall in Redding, CA., you’ll get to hear a wide array of music. Our own Vigilante Kindness President, Alicia McCauley, will be sharing stories and photos of her recent work with and for students and villages in Northern Uganda. Tickets are $20. 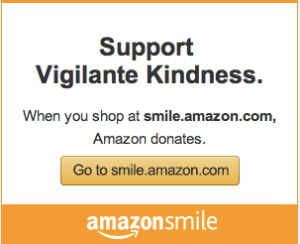 100% of the proceeds benefit Vigilante Kindness. Click here to purchase your tickets and please invite your family and friends. Thanks to Thrivent Financial, for consistently supporting our work, including this benefit concert. It’s going to be a great night, so go buy your tickets and we’ll see you at the concert!